No work on this yesterday because I was busy with other things. So a big push now to get it ready for tomorrow. There was more wax polish left in the tin than I’d thought so everything has had a second coat and, in a few cases, a third. The first parts to be put together make up the flyer assembly. The flyer is the U shaped piece holding the bobbin. The base it all sits on (with the Ashford logo) is called the maiden board – I have no idea why. Then the legs are fitted into the base and the treadles are fitted into the holes on the rear legs. Screws which go in at an angle hold the legs on. You have to be careful putting these in. 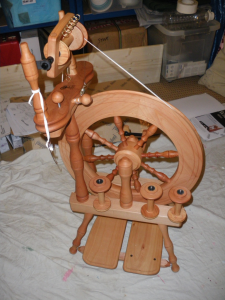 The wheel goes on next with the cranked bar from the treadle drives acting as the axle. There’s a fiddly pin that holds axle and wheel together, which you can just see as a black line across the hub of the wheel. Finally the posts to support the flyer assembly, and then the flyer assembly itself, are fitted. A few finishing touches, like the drive belt, and we’re there! I’ll take some better pictures tomorrow when it’s out of the cellar (from which Theo is temporarily banned) and in natural light which should help the lovely colour of the wood show through. The flash is tending to make it seem a bit darker and redder than it really is.